What is TotalFinder? It is an 'extension' to Finder in a way that it adds incremental or missing functionality to Finder without being a separate program. 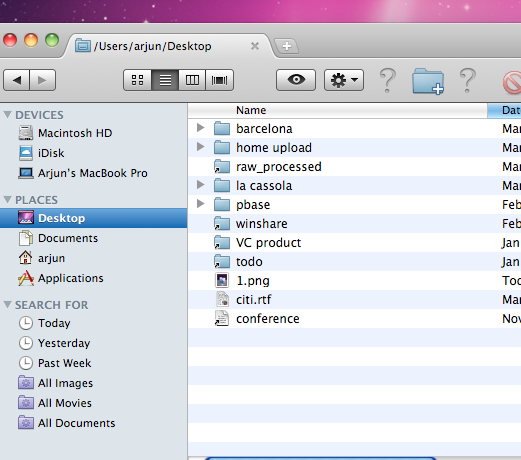 In other words, if you are using Finder, the functionality is integrated right there. You don't have to start a new application called 'Total Finder' or whatever. In fact, if it did, it would be dismal failure. No one would use it. (Remember the many times you may have downloaded windows explorer alternatives only to discard them after a few weeks?). So TotalFinder just enhances the existing Finder in an integrated fashion. No new program. How does it do it? Well, my understanding was that TotalFinder was a SIMBL plugin. SIMBL is mechanism developed by Mike Soloman that easily allows you to 'hook into' existing OSX apps to enhance them. I happened to read a blog post that says that starting Aug 2010, TotalFinder no longer needs SIMBL. You can read that post here. Anyway, bottom line is SIMBL or not, it works super great. Notice the little tab on the top, that is a hint on some of its new functionality. Subtle. Thank the lord the author did not choose to replace the finder icon with something totally different or gross. Yes! 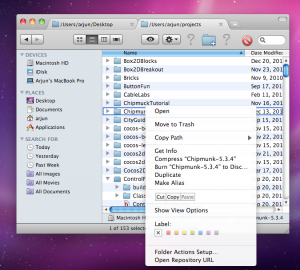 Total finder implements tabbed browsing. You can open lots of tabs with different directories. Just like Google Chrome. Infact, it reuses the Google Chrome tab engine code for this. And just like Chrome, you can tear the tab into a new window. Here is how tabs looks: As clean as Chrome. Also, the other feature I love is that Folders are at the top, irrespective of their lexical naming. 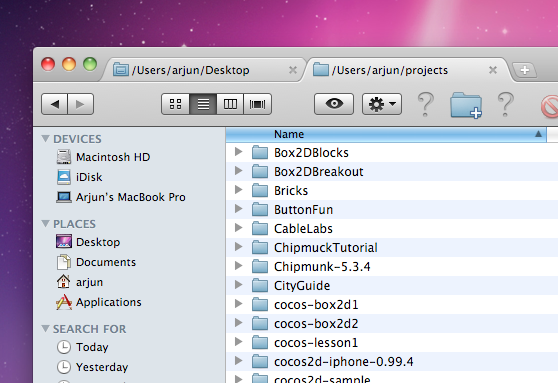 By default, OSX sorts folders and files the same according to the alphabet. 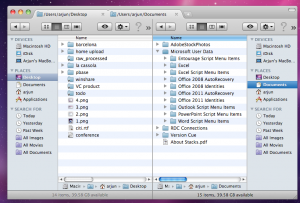 So you will find folders interspersed with files in any directory. I understand this is subjective, but I *hate* that. I treat folders as a 'hierarchy point' and not a leaf node. They have no business being sorted along with files. Obviously, the TotalFinder author feels the same way. Hooray! See? It has a left panel that controls the left view and the right panel that controls the right view. Fantastic!!! There are some other features the author provides, which I really don't use. If you use them, it can help you. You can go to the author's home page to check them out. TotalFinder is not free however. You can buy it for $15, or, if you "qualify", you will get it free. I got it free. When I first found out about TotalFinder, I noticed that Antonin said if you were a blogger, or an open source contributor, he will give you a free copy. Well, I blog, so I just emailed him and he responded in 2 minutes with a free license. In return, I promised to write about it. Note however that I am not writing a good review just because I got it free. If I found it crap, I'd write about it, but say its crap. But I loved it. Thanks Anotin, for a great piece of software. And finally, the author also seems to really keep it updated. I recently updated to OSX 10.6.7 and within a day, he had a patch out. How nice is that! A very informative sharing and I enjoyed learning every bit of it pretty much!! Thing is to configure a computer related issue properly I think above suggested ways are highly effective. Thanks. About total finder and total satisfaction whatever shared here seems to an informative piece of demonstration!! I have great time reading through such educative article and looking forward to learn more about such topic.